“Both the votaries of Hindutva and the beleaguered defenders of the Nehruvian order were united in viewing the demolition as a point of rupture. For the former, the change would herald a Hindu reawakening; for the secularists, it threatened to destroy India’s pluralism and transform the country into a de-facto confessional State. “Both sides of the confrontation, it would now seem, were guilty of hype. India wasn’t transformed into a Hindu Pakistan and the Constitutional edifice established in 1950 remained strong and intact. To borrow A.J.P. Taylor’s description of the 1848 revolution in Europe, the Babri demolition was a turning point in Indian history when history refused to turn…. “With the benefit of hindsight it would seem that the contemporary misreading arose from the premise that the Ayodhya movement was overwhelmingly an explosion of faith and sublimated Hinduness. The implication was that a new religiosity had penetrated the popular psyche and begun influencing secular life…. This entry was posted in Churumuri Poll, Hindutva, Moditva, Issues and Ideas and tagged A.J.P. Taylor, Ayodhya, Ayodhya Title, Babri Masjid, Churumuri, Jawaharlal Nehru, Manmohan Singh, Ramjanmabhoomi, Sans Serif, Swapan Dasgupta, The Telegraph. Bookmark the permalink. This is unlikely to be a landmark judgement. More likely, it will a half baked one that attempts to satisfy everybody but will end up annoying everyone. Who needs this judgement, anyway?The status quo is the only option for the present. What are the odds for some holidays post-judgment? Madam, Behenji seem to be worried a lil bit.. do they fear that BJP might get a surge after this ? whoever wins it, I don’t think the problem will be solved for good. In banana republics living with a stone age security and judicial system, the problems will never be solved; it will just be changed from one form to the other. There is no question of “winning” anything. Ayodhya is already, by default, of the Hindus. Just as Mecca is of the Muslims. Dasgupta seems to assume that an adverse response to the verdict on Ayodhya can be expected only from the Muslims, and not from the Hindus. He may be right, but not for the reasons that he puts forth. He asserts that the Hindus, benefiting from an economy that has changed drastically for the better in the last two decades, have turned to more “wordly” affairs. But what is a more plausible reason is that those who were in the forefront of the Ram mandir cause don’t have it in them anymore to make a fight of it. Advani is hopelessly discredited, and what constitutes the loony Right is old — many have one foot in the grave — and lacks unity. Also, hate is a much more energetic emotion than anything else. The motivation that comes with the goal of destroying something is any day more powerful than creating something new. “Mandir wohi banayenge” doesn’t have the same ring to it as “ek dhakka aur do.” Advani and his cohorts are intelligent enough to realise that they can’t whip up a frenzy for the construction of a temple at the site like they did in 1992 when they demolished the mosque. It is amusing to read Dasgupta saying that the Ayodhya agitation “encapsulated protest, millenarianism and modernity under one roof.” Modernity?! @Karihaida — I too think from the initial pre-action from Chachawadis this case is going to go to Komuwadis. @Complex–another decade or two :-(.. Forget it. Even another century or two may not be sufficient. This case has been fast tracked by Allahabad high court. In 1955, Allahabad high court was very upset about case taking nearly five years in court and hence fast tracked it to provide a speedy judgment.. The fast track took 55 more years!! !All the plaintiffs and defendants in first and third case are dead. Only plaintiff in the second case is alive. Whichever way you think.. justice delayed is justice denied… So why are we discussing which way the judgment will go..India should demand “Right to speedy trial” as constitutional right. Just think how less quarrelsome this whole issue would have been if the judgment had come in 1955 before Chacha interfered. By which time, most of us who lived through the times of the Ayodhya/Babri mosque issue might well be dead :) And this will become yet another historic axe to grind and spread stories about to suit one’s point of view. The good thing is that at least all political parties have sent out the message that they will honour the court’s judgement – whenever that happens. If you want the BJP to win so badly, you should get off the internet forums and hit the road to do some real campaigning. Your wish of knowing what a tribal is might also be satisfied to an extent? Which is very clearly visible in your comment. They say it, but we ought to be apprehensive about what they will actually do. I dread to think of mobs running riot again! We need massive paramilitary force deployment, and preventive arrests of dozens of people if we are to maintain peace. We ought to prepare ourselves for a curfew in several parts of the country. If we don’t do all this, we will certainly see massive rioting and killings, irrespective of which side gets the favourable verdict! Seriously the politicians are beating a dead horse. If the politicians detest from rousing a rabble, the whole issue will be a no-show. @Daily Bread — if it wasn’t hatred, what else was it? To be going round demolishing places of worship, or butchering people who don’t belong to your religion (Gujarat 2002) doesn’t exactly stem from an emotion called love. I have not had the bad fortune of directly facing the brunt of any riots. One time I heard about any such situation in my family was as a boy when my great-grandmother talked about a time in their village when the men used to arm themselves, and women used to boil oil and keep it ready etc., during the time of raids by Muslim troops. I dont even know if these were real or imagined threats, but they did sound adventerous listening to that story at that time. So being an armchair lounger, I tried to come up with a list of things to keep in mind in case I am in danger of being caught in a riot or crossfire which is common in India. 1. Protect yourself and your family. And by that I dont mean take revenge or inflict pain on any attackers or would-be-attackers, but do whatever it takes to avoid getting hurt or suffering personal physical or mental damage. Mostly this would mean plan an evacuation to a safer place in case of imminent danger, and where necessary have effective self-defense if it comes down to that. 2. Have trust in the law of the land. This may sound like a joke, but here I am not talking about just the law enforcement or political authorities which often only protect the privileged in India – the land of no social justice – but this to me seems to be best way. As far as possible try not to break the law. The law BTW allows us to do whatever it takes in self-defense. Know that, and try to respect the law instead of being openly opposed to it due to personal beliefs, group think or some religious principles. 3. Before things happen, reach out to friends in the other groups to see what the reason for their hate is. If it is small things – because I put on loudspeakers and annoy them during festivals, do something which they think is bad – there is definitely room to come to some understanding on those issues, without compromising on my principles. I know this one is tough too, especially in emotional and uneducated India, but no harm in putting some effort into it. 4. Pursue using whatever is the law of the land on someone, once you know they are the ones personally responsible for the attacks on you community. Do not let the trouble mongers get away easily from the law, whether he is a politician, criminal don or an organization. 5. When you are forced to think of taking pre-emptive revenge or inflicting pain on anyone on the ‘opposite’ side, think a little about what that will lead to in the long run. Someone did something some years ago to my people, so should I go punishing someone remotely related and make things worse instead of better. There is no end to that. I dont know if this is even possible when faced with real personal losses to a rampaging mob, and I hope I dont have to face this choice anyday. And I am hoping, as a fellow churumuri commentor, you and your family are safe and sound whatever be the judgement in the Ayodhya/babri mosque case, whenever it happens. Thanks..Very reassuring post. Its not that anything dangerous will happen, but bcos of the post Babri demolition mayhem…we think of an imagined threat looming. The threats are usually instigated and politically motivated. I fail to comprehend that politicians for increasing their political mileage are ready to sacrifice the country itself. Very selfish. I recollect watching a teleserial named Tamas, starring Om Puri. Excellent screenplay and great depiction of the truth. It has displayed how emotional frenzy was used for political purposes and how herd mentality was channelized for creating communal disharmony. At such times even the best of friends turn a blind eye. I agree a lot of short commings on both sides are there, and there is a huge scope for improvement. I pray to the Allmighty that the right sense prevails among all, especially among the uneducated and emotional lot of all relegions. But I am reassured that the educated masses are very open and broad minded like you. But dont count on the educated masses to do anything if and when riots really happen. And we are as susceptible to think out of our asses and become emotional idiots as anyone else. Tamas was good stuff. Arundhati Roy wannabe is it or atleast a Barkha Dutt ? ;) Seriously whats with the thatha talk ? Win or loose this is BJP’s game to throwaway, the lost hindi heartland decade can come back to them in an instant. I just hope they plan it cleverly and not let some old gezers dictate the terms. What fantastic bilge! Really? Somehow, Dasgupta seems to be reassuring himself more than others that the motives of the Hindutvas were pure. Surely there were other ways of defeating an “incapacitated socialism” than playing the religion card – that is just crude and beneath dignity. Although, it would be interesting to find out correlations between the RJB movement and all that followed and the opening up of Indian markets. Did it play any role, inadvertently, to usher in LPG? Or did the License -permit Raj die a natural death that had nothing to do with the antics of right wing “loonies” ? Of course, at no point were the BJP seriously going to pursue radically new dimensions in governance. Ends do not justify means and nobody, not the most devoted kar-sevak knows clearly what end Advani and his cohorts really meant. The BJP never did sell a vision of free and fair capitalism, did they? They only fought for monopolisation by a different set of goons. The circus will continue, me supposes. Now Ram Mandir. The case was brought to court in 1885. In 1886 judgement, the court agreed that the masjid was built after demolishing the mandir, but was unable to give relief to Hindus. Keep this fact in mind and never repeat that the issue is only 60 years old. In fact, British had Regulation dating back to 1772, in which if a complainant was a Hindu and defendent a muslim, then the case would be decided by SHARIAT. Had Hindus any chance of judicial relief? 1. Can a masjid be rebuilt? 2. Can a Ram mandir be built? 3. Who has given a categorical assurance to muslims that the Masjid SHALL BE REBUILT? Any names? Any party? Mulayam, Laloo, CPI, CPM, Agnivesh? Who? NONE. 4. Who has given a categorical promise of a Mandir? Sangh Parivar, BJP. Sangh is at least honest about its stand, and everyone knows it. What is the stand of secular brigade? Are they courageous enough tp promise a masjid? You can obstruct the mandir till you have an Islamic Republc of India, but till then you cannot build a masjid there. Do the muslims want a masjid? Oh, yes. Do they think it would be rebuilt? NO. Do the Hindu not want a mandir? Yes, if you are in a fool’s paradise. Any surveys? NO. Majority Hindus are satisfied with make shift temple, but all have a faith in Ram Lalla Mandir of Ayodhya. It is foolish to ask if Ram was actually born, or born in Ayodhya what to talk of the exact spot. Will the secular brigade demand that haj subsidy be cancelled till muslims prove that Kaba is actually the house of their god? Can they prove it? Will anyone even dare to ask? NO. After all, fatwas can be SO REAL!! What is he so afraid of? Reason? In fact Swapan’s words actually point out to an alternate reality – the Ayodhya movement was probably not about religion at all but an outcry against upper-class smugness. The issue is not whether there was a mandir there? was Ram born there? etc, etc. The issue is why in modern India’s history did a group of people commit such a wanton and provocative act? Their motives could not have been anything but mischievous. How will the Ram mandir if it does come up bring succour to the Hindus? Especially since Hinduism is itself a diverse religion. Ram is by no means a universal Hindu favourite. So that probably explains why there will be no convergence at any declared “holy site”. Poor Ram. He has been the centre of a raging debate, that is getting sillier by the year. This is not the role that his creater poet(s) envisaged for him. He is supposed to guide people to be virtuous, self-sacrificing and kind. I don’t detect any such benevolence in professed Ram devotees. The BJP and the Sangh would be loth to let go so easily of a potboiler. They probably do not want the mandir in Ayodhya because that would rob them of their favourite electoral plank. The fortune of too many politicians revolves around the mandir not coming up, so, bad luck, Ram devotees. Maybe next life? Thanks for reminding the disgrace called regulation act of 1772 which stipulated that in the event when one of the parties to a dispute is Muslim and other is Hindu, Sharia will be applied to solve the dispute. Someone from Ayodhya had told me local muslims of Ayodhya are in support of Mandir. In fact the legal heir of the mosque from Mir Baqi family has refused to join mosque supporters all along.. is that true? Visited tribal area in the forest – that was quick! Please take some time to do a Churumuri writeup on your impressions – I will be looking forward to reading something written in your witty style. I would like to know what exactly would be a solution for this Babri problem. If it wasnt in the court of law….and people(not politicians) decided to solve this case..Could this be something like a masjid & temple sharing walls? Or even if the court decided a verdict..but responsible guys on either side..wished to have a structure with both prayer halls in it. This would be a real winner. I bet if a survey was taken today, then more than 90% will go for this solution. But I am also sure politicians would’nt like this. How would they derive any mileage if both parties solve amicably? Also I see a pattern in this whole thing…1990riots…2001-2 riots….2010-11? Once a decade..so people do not forget or is it people should not be bored? Swapan mightt have got sometghing right….secular modernists are frothing at the mouth. >Someone from Ayodhya had told me local muslims of Ayodhya are in support of Mandir. That someone might have seen how the non secular modernist hindu is wasting his disposable income to boost the local economy in neighbourhood templetowns like Haridwar, Kashi and Prayag. Tanveer, I support your idea of a mandir-masjid. But the very large-heartedness of that solution will work against it. Hey guys did you know it was possible to be both secular AND religious. A person going to place of worship need not be non-secular and vice-versa. Again, a good understanding of the word ‘secular’ will serve us well in future debates. There is a difference between secularism and atheism. Hey!! I dont know its a Website or a Private Poll Blog, I think you are an Indian PLEASE dont call it as WINNING OR LOOSING its just a process. It cames into the limelight for some BLOODY POLITICIANS who wanted to boostup their POLITICAL CARRIER they will do anything to show their presence. We are Indians who evers AYODHYA but its belongs to INDIA first. It may belongs to HINDU or MUSLIM it doesnt matter…. Think as an INDIAN first. PLEASE PLEASE dont provocate anybody by this silly POLLS. If its HINDUS or MUSLIMS nobody will gain with that it will stay at its place thats which is in INDIA. I am proud to be an Indian first…….. I LOVE MY INDIA only not my Religion or my Cast or my Financial Status its all secondary. Be an Indian JAI HIND….. Lets have a hospital in the disputed place. If i am the judge, I would have ordered the govt of india to spend 1000 Crores to construct a structure in which a Temple and a Mosque be built together, which should be a MODEL for entire WORLD. and which should be free to all with a huge common entrance. 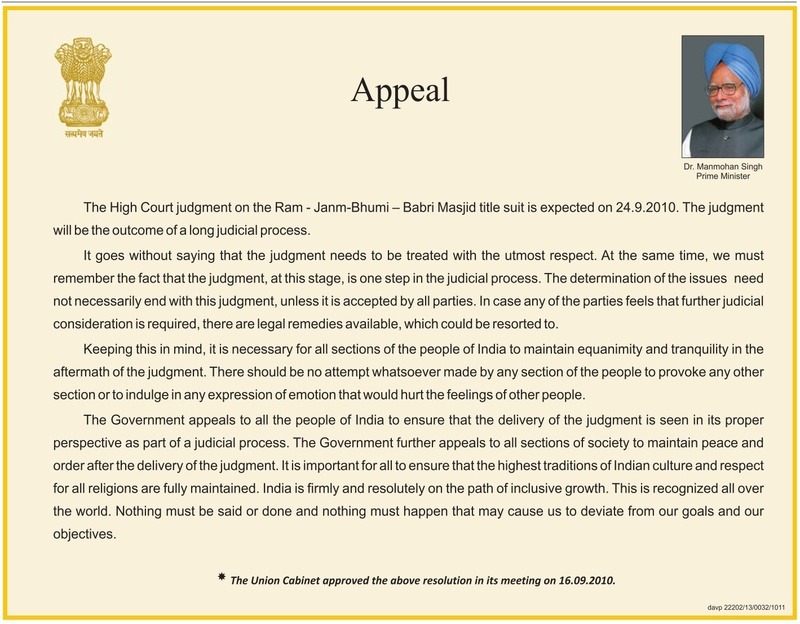 This might be the correct judgement.May Ram and Raheem give wisdom to the Lordships in order to prevent this kind of Judicial blunders to wait for another 6 decades to decide at supreme court regarding same matter. Its certainly not write to demolish a masjid just because it was once Ram temple before or that place belongs to Ram. If that is justified, then there are many places in India where the current mosques were once temples that have to be destroyed and by doing so, it will lead only to more of hatred and violence. I dont think Lord Ram likes his men killing people and demolishing mosques in his Ramarajyam. We must forgive the men who did mistakes in the past and must not punish their decendents now, for their ancestor’s mistakes. And as far as the verdict is concerned, I just hope the Court orders the government to take over the land and use it for some development work. If that is not possible, atleast the court must give it in favour of muslims, as in recent past it is we hindus who have made the mistake by demolishing the Mosque. And still, I will be a proud Hindu. Jai Shree Ram. I really wish there were more people like you. I strongly believe that the verdict should go towards the Muslim brothers for a simple reason that amar already quoted. If there is a Mosque or a Temple does not contemplate if Rama Existed or Not its just a symbol. I have visited Ayodhya in late 90’s and its really like going to a War Zone. None even gods would not like to visit such a place where you are checked / scanned at every corner of the street. In Ayodhya there are about 12,000 Temples and about 4 Mosques. So having a mosque or a temple just does not signify anything. The political parties just want to divide people and thats what they are doing. The Parties can take this up and set a resolution that its Governments property and they can build a muesuem or park or anything but they dont want to do because they want to divide the people.